It’s no secret that Boulder boasts a wealth of top-notch hiking. 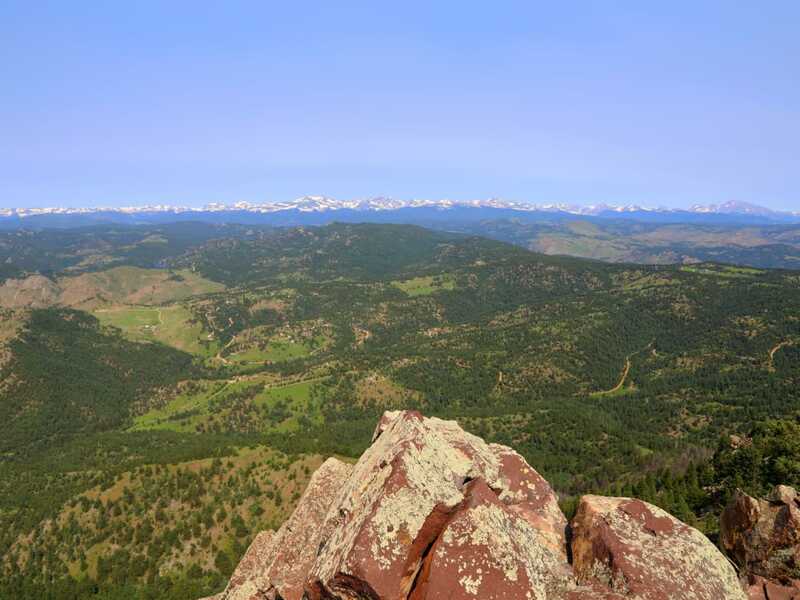 The foothills and mountains above town represent the eastern terminus of the Rocky Mountains, rising up to elevations more than 8,000 feet—meaning a great workout is almost guaranteed if you’re starting from Boulder, which is roughly 5,400 feet above sea level. Meanwhile, the mesas and plains in east Boulder offer mellow terrain rich in history and ancient geology. Here, a look at 10 of the best day hikes in Boulder—once you’ve knocked these off the list, there are many others to discover! For detailed maps and directions, check out Boulder Open Space and Mountain Parks website. Mount Sanitas is a favorite among locals for both its views and ability to provide a serious workout. James Tiffin Jr.
It’s easy to see why Mount Sanitas is Boulder’s most popular mountain. Despite a modest elevation of 6,843 feet, this beloved hike is a real-deal workout with more than 1,300 feet of elevation gain. Spacious views of Boulder, sprawling plains, and Denver to the east are complemented by the dramatic panorama of the Indian Peaks to the west. The 14,255-foot Longs Peak dominates the mountainous skyline from the summit of Mount Sanitas. The classic Sanitas loop features steep sections mixed with flat, shady, segments. Take the 1.1-mile Mount Sanitas Trail to the top, descend the 0.7-mile East Ridge Trail, and return via the Sanitas Valley Trail for 1 mile. For a more gradual ascent, the Lion’s Lair Trail is a smooth, shady 2.9-mile trail (one-way) to the top, ideal for runners (though be aware dogs aren’t allowed on this trail; they’re allowed on the other Mount Sanitas trails). There are several ways to the top of 8,150-foot Green Mountain. The standard hike begins at Gregory Canyon and ascends roughly 3.2 miles to the top (there is a slight detour for dog traffic at the halfway point that can tack on an extra 0.2 miles). Take the Gregory Canyon Trail to the Ranger Trail for a tour that features remnants of the powerful floods that hit Boulder in 2013. From the top, hikers can link over to neighboring peaks via the Green-Bear trail. There is a fun, easy rock scramble to the summit of Green Mountain. If you’re looking for a unique way up Green, try going up Chapman Drive (a dirt road converted to a non-vehicle hiking/biking path) and connecting to Green by crossing Flagstaff Road at Realization Point. However you reach the summit, be sure to check out a metal disc on the summit shows the names of distant mountains that’s a Boulder icon in its own right. 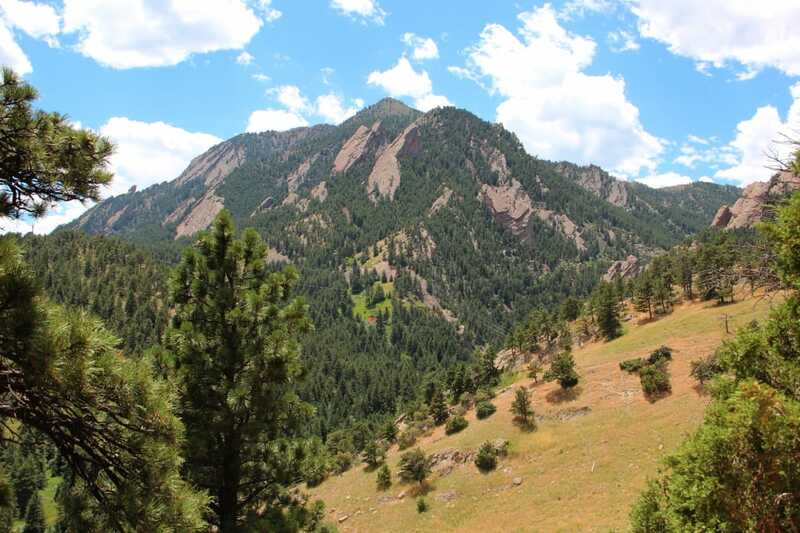 At 8,459 feet, Bear Peak is the second-highest of the trio of the "Guardians of the Flatirons" peaks above Boulder’s famous rock structures, but it has the most exposed summit, complete with unobstructed 360-degree views. The three standard routes up Bear are Fern Canyon, Shadow Canyon, and the West Ridge. All are rugged trails with switchbacks, stone-stairs, steep segments, and passage through recent burn zones. To reach the summit, a brief and easy scramble with excellent hand and footholds awaits along iron-rich, red rock. On a clear day, hikers can see from Pikes Peak to Long Peak and the full range of the Indian Peaks in between. Linking up to nearby South Boulder Peak is a good option, as the hike between the two only takes about 20-30 minutes one-way. 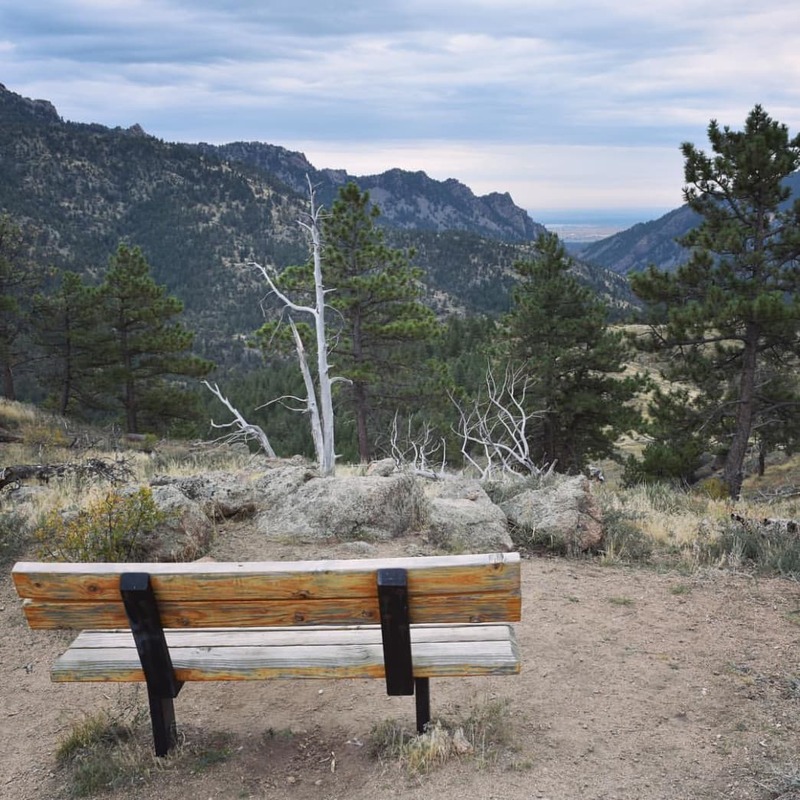 Marshall Mesa in south Boulder has a network of trails that interconnect from the suburbs to the east all the way to the 8,000-foot peaks to the west, so your hiking day can be as long or short as you like. This modest mesa has incredible views of the Flatiron Rock formations, especially from the highpoint on the Greenbelt Plateau Trail. Besides the natural beauty, hikers can check out the towering windmills south of the trails or take in the twinkling lights of Boulder at twilight. There are informational plaques along the way that share the area’s geological and mining history. Marshall Mesa offers a great family trek, trail run, photography playground, and casual hike, though it can get a bit hot in the summer due to a lack of shade. To connect to the western trails, a tunnel under Highway 93 on the Community Ditch Trail offers safe passage to the open grazing lands leading to the foothills. A 8,549 feet, South Boulder Peak is the tallest of the summits above the Flatirons, and yet it’s the least-visited of the three. 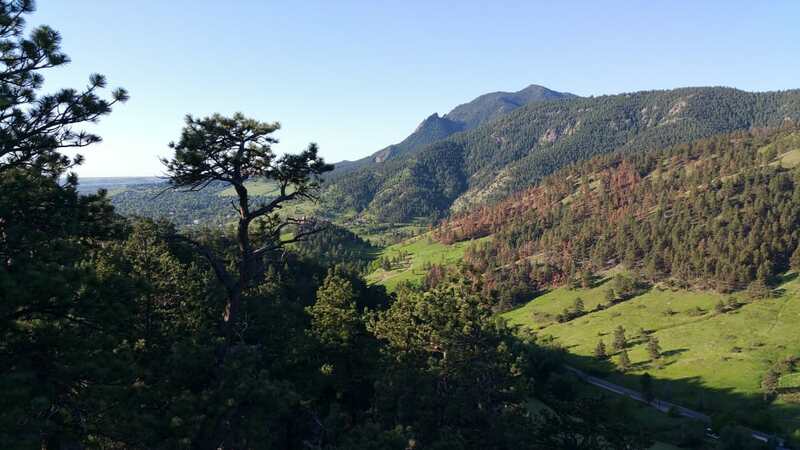 The standard route takes the Shadow Canyon Trail to the saddle between Bear Peak and South Boulder Peak, where ghostly stands of trees and charred ground remain from recent wildfires. Follow a winding trail through a high forest to the boulder-strewn summit, but note that views to the east will be blocked by pine trees. 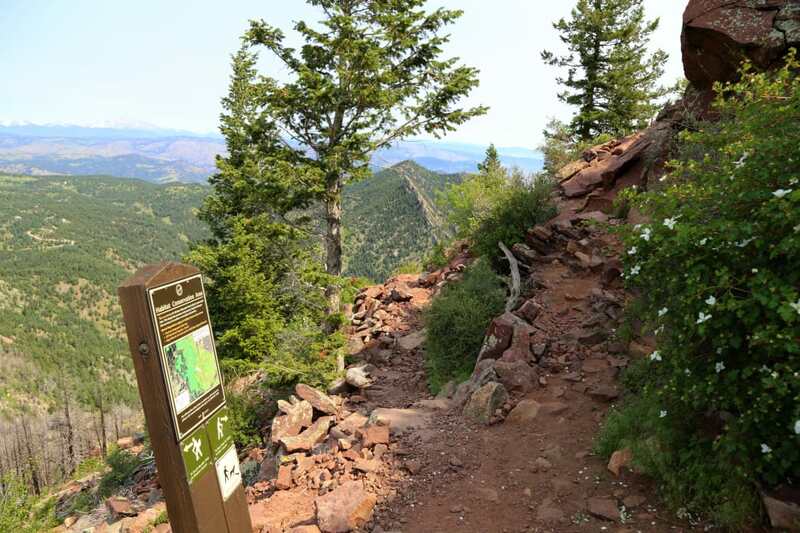 Many hikers link Bear Peak and South Boulder Peak for a two-fer—or add in Green Mountain for a three-fer, using the Mesa Trail below the Flatirons to loop back to the South Mesa Trailhead, where all the fun began. Even though it stands at 8,917 feet, it’s easy to miss Sugarloaf Mountain. Its bare summit blends into the undulating land between Boulder and the Indian Peaks, and it’s just far enough from downtown Boulder (roughly a 20-minute drive) to remain less popular than easier peaks. The large parking area is located at the convergence of the Sugarloaf Mountain Road and the dirt-road Switzerland Trail. 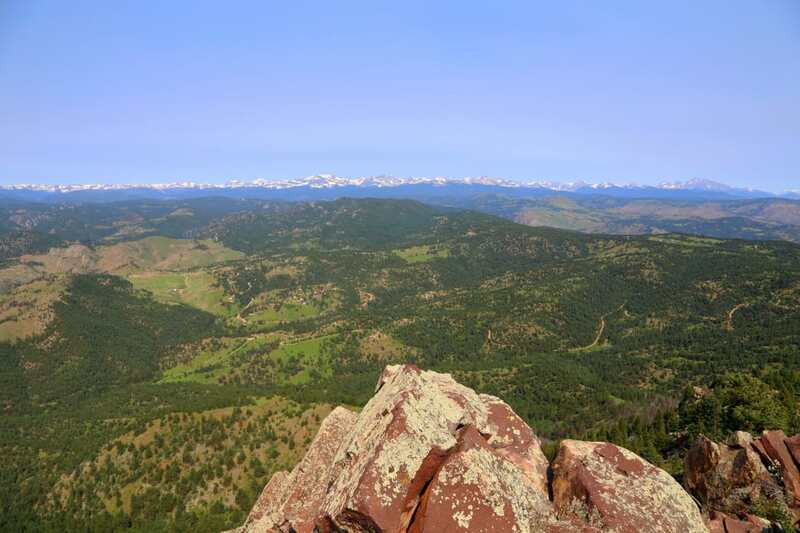 The mostly unmarked but obvious trails start to the west of the parking lot and ascend a mile on a rocky but never-too-steep trail that gets better the closer you get to the top, where views are perhaps the best in Boulder County. Sugarloaf’s mountain community resembles a Swiss village, while expansive city views to the east and mountain views to the west highlight Sugarloaf’s station between worlds. This is an excellent winter hike on a bright, blue January day, as the snow adds a lot of character to the landscape. Sunset hikes are encouraged in the summer. 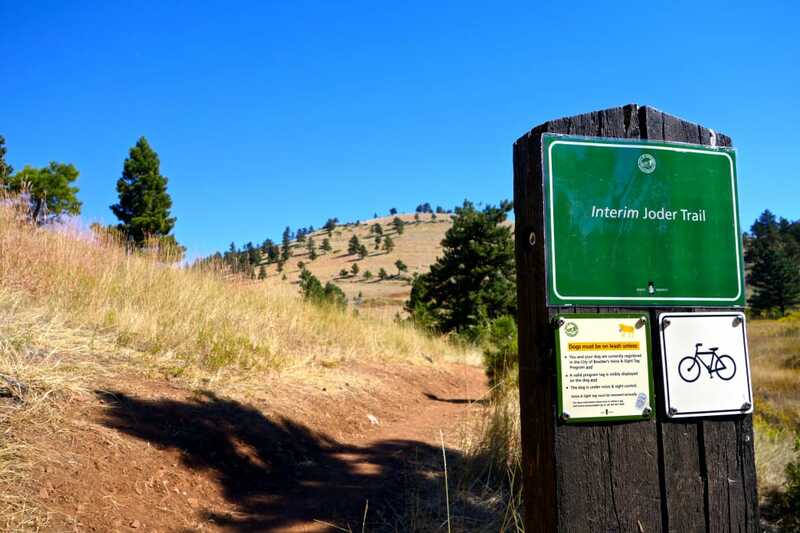 Joder Ranch is one of Boulder’s newer trail systems, and its eponymous hike is a simple, 4-mile out-and-back that ascends a ridge and descends into a formerly "secret" portion of Boulder Open Space that connects with Olde Stage Road. It’s this second half of the trail that is worth the visit, though the initial views from Joder Ranch will likely provide a vantage of Boulder most have not seen before. The west side of the ridge is a peaceful, shady, pine forest with a few open meadows and plenty of solitude. Wildlife sightings are common, including black bear and deer. Mountain bikes are allowed on the trail, though traffic is fairly light by both two-wheel and foot traffic. To get there, access the interim trailhead off Highway 36 that has parking for about a dozen vehicles. Another family-friendly destination with excellent views, Flatirons Vista is the sister-mesa to Marshall Mesa. Both can be connected either by crossing the tunnel under Highway 93 at Marshall Mesa or the road crossing that connects the Greenbelt Plateau Trailhead and Flatirons Vista. There are lots of loop options, though it’s worth taking the 1.5-mile Flatirons Vista-North Trail to the wooded Dowdy Draw Trail. This trail switchbacks down a hillside with impressive views of Boulder to the north. Hike back up, loop through the still forest of the Flatirons Vista-South Trail for an excellent one- or two-hour walk in the woods and over the plains. Walker Ranch’s full loop is 7.6 miles and starts just near the highest point of the ranch. Hikers descend roughly 600 feet to South Boulder Creek, where the rushing water can be particularly powerful in the spring. Passing through meadows and forests, the loop eventually reaches a rocky outcrop where a steep, sustained staircase accesses the second half of the loop (watching mountain bikers haul their bikes up these steps is quite interesting). There’s no better direction to go most of the time, though on hotter summer days it makes sense to descend to the right (counterclockwise) so you aren’t hiking on the sunny, exposed hillside as much. Be careful with afternoon lightning storms in the summer and autumn, as the start and finish of the loop is fairly exposed. Betasso Preserve is a popular mountain biking destination, but on Saturdays and Wednesdays it’s closed to bikes—so if prefer your hikes without getting buzzed by hard-charging riders, aim to go on one of those days. The Canyon Loop Trail explores a portion of the old Betasso Ranch, with open meadows, shady pine forests, and small creeks running through the property. Hikers who want a longer day can tack on the 3-mile Benjamin Loop (and the 0.75-mile connector, one-way, between the two) to explore more deep forests, dotted with the occasional open view. Many species of wildlife call this area home, including fox, black bear, coyote, and skunk. Dogs are welcome but must be on leash at all times.